Top brass at the Australian Securities and Investments Commission have claimed on a number of occasions that the corporate regulator does not do favours. However, a series of internal emails obtained by Business Day shows ASIC gave special exemptions to the funds management industry after requests by its peak lobby group. The exemptions give big fund managers relief from having to provide reasonable and appropriate advice to their customers – including disclosing the effect of fees on a fund’s investment performance. In the lead-up to the Super Choice reforms in 2005, where for the first time investors would have been able to choose between low-fee industry funds and higher-fee retail funds, the Investment and Financial Services Association (IFSA – since renamed Financial Services Council) lobbied ASIC to amend the laws. ASIC duly provided exemptions for retail funds from having to disclose the effect of fees in their online calculators. These calculators are used by the likes of Colonial, MLC, AMP and BT as marketing tools that indicate investment returns after potential investors input their personal details. Had ASIC not issued the exemptions, consumers would have been able to quickly compare the costs of investing with a range of funds, including industry funds, whose fees are lower than the retail funds owned by the banks. Likewise, investors might have paid lower fees over the past eight years. At the least, they would have been made properly aware of the effect of fees on their investments. ASIC has asserted that all its relief orders have been made in accordance with its regulatory policy and the law. But the internal emails show the orders were made contrary to advice from the regulator’s own consumer protection division and contrary to its own legal advice. In an email from ASIC’s director of regulatory policy Mark Adams to staff in late 2004 – including commissioner John Price – Adams suggested staff begin drafting a Class Order in line with advice from IFSA, advice that would shield the funds from having to provide ”appropriate advice”. In response to a series of questions last week, an ASIC spokesman said its relief orders ”clearly reflected the government’s policy position” and its own regulatory policy. 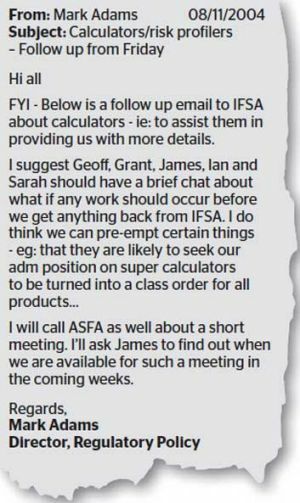 At the same time as IFSA was lobbying ASIC, however, the Institute of Actuaries, an independent professional body, was expressing serious concerns to ASIC about the calculators. According to another internal memo from Lisa Rayner of ASIC’s Regulatory Policy Branch, the Institute of Actuaries had said the calculators were misleading. Instead of ASIC consulting, however, ”The I of A were swiftly told that this was something to raise directly with Treasury”. The emails show the notion that calculator relief was required was not ”well settled” at the time ASIC pushed through its exemptions. The law was clear that calculators gave personal advice and they therefore needed to give appropriate advice.